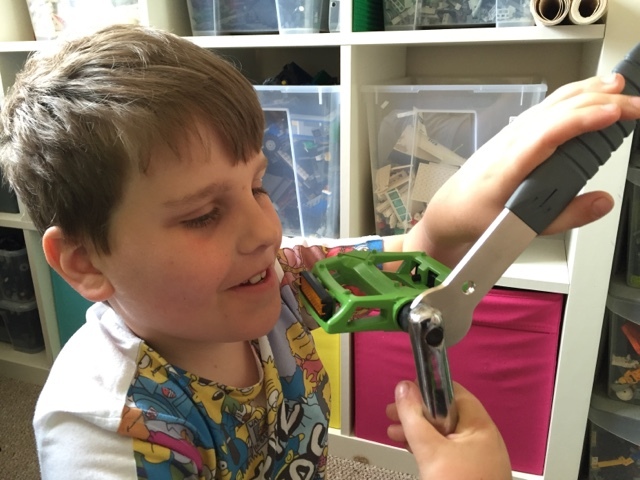 I am loving this bike building with Seth at the moment, the pedals we ordered arrived yesterday and the look on his face when he opened the package was priceless. Seeing the boys get excited about things they are creating is really moreish. 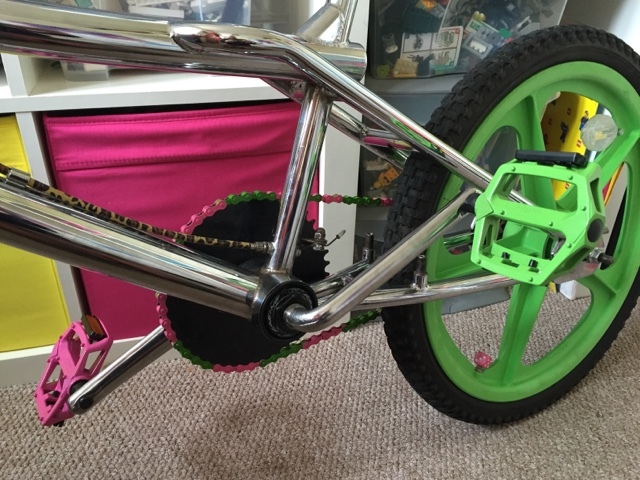 His new bike (for when he's that little bit taller) is really starting to come together now and it's making me want to build one for myself. 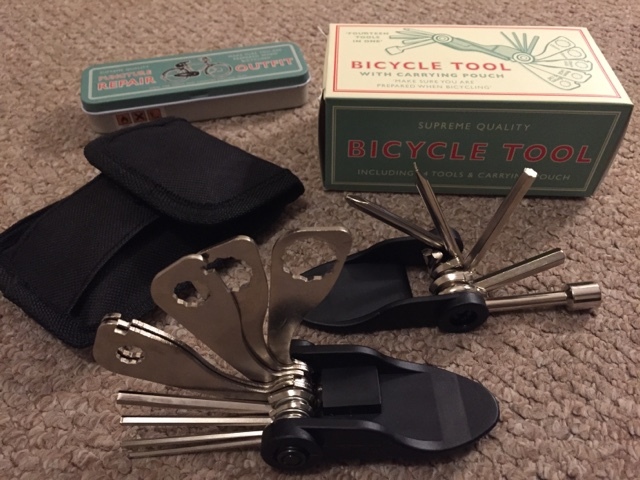 Since starting the build Seth mentioned that he would love his own tools for tinkering with his bike so he was really chuffed when we received a package from Rex London after being included in their 12 dynamite daddy blogs. that included a bike multi-tool and a puncture repair kit. It is always lovely to hear what people have to say about the blog and I'm touched to come in their top 12. Thanks to the great package all Seth needs now is his own mini tool box. Again Seth did a great job of attaching the pedals himself and they look great. We've also now ordered brake pads and some skyway handlebar grip's to go with his swanky wheels. All that's left on Seth's BMX list is brake levers, calipers and a saddle and then we can concentrate on designing decals, which I think he is excited about the most. 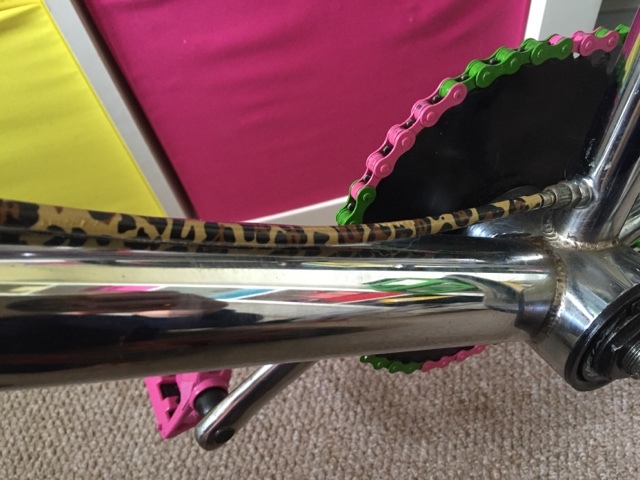 We had talked about replacing the brake cables with something a little more colourful, but then Seth came up with the idea of making use of the remaining patterned duck tape from our Pedalflow. While he played with his friends outside a few days ago I sat in the garden and wrapped his cables, it was a really nice touch and a great idea by Seth. This bike is all Seth and I'm really proud of how interested he has been during this build so far. It's important to have hobbies and as I've said many times before it's great to have a couple of projects on the go with your kids. These are experiences that they will remember forever.